← What’s wrong with the economy? I don’t see much talk going on lately about leadership. Sure we talk about who we think are good leaders, especially when we talk about presidential candidates, or CEO’s of major corporations. I’m thinking about lower levels however. Like the local TEA party leader or the project superintendent or journeyman trying to run a crew. You know people like us. John Keegan in his study of leadership “The Mask of Command” talks about 4 kinds of leadership: 1.) Heroic Leadership, 2.) The Anti-Hero, 3.) Unheroic Leadership, and 4.) False Heroic Leadership. I recommend you read the book. So, here we go. 1.) Heroic Leadership. This was the first to emerge. Keegan’s example is Alexander the Great. There are bunch of others. If you want some others read the citations for the Medal of Honor or the Victoria Cross. We all know this leader in either the military or business, although in business there really isn’t too much demand for this style of leadership; unless, I suppose working 12 or 15 hours a day fits your definition of heroic. As hot as it was today in Nebraska, it probably comes close. 2.) The Anti-Hero. Keegan’s example is Wellington. This is a good business model, although it probably doesn’t work terribly well in large bureaucratic businesses. To me it seems ideal for a small company that prefers to promote from the ranks. The basic idea is in Wellington’s own words “to take trouble”. What he meant was attention to detail, unwillingness to delegate, ability to do without sleep, disregard for personal comfort, and contempt for danger. * This sound a lot like a small business manager to me, if fact my Dad comes to my mind, as well as others. It works, it’s hard on the family and friends and it is very easy to get into this mold, especially when you are understaffed, and very hard to let go. 3.) The unheroic. Keegan’s example is Grant. What we are really talking about here is the American model, as we know it. As the Civil War was the first of the modern wars so was it’s officership, at least eventually. 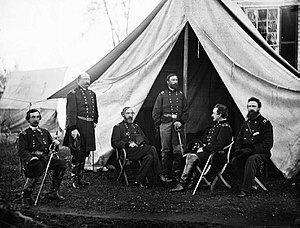 Grant was the very model of a modern major general. Superb in writing telegraphic and other orders, completely capable in logistics and determined as all get out. He worked almost exclusively through his chain of command, even when he was co-located with The Army of the Potomac. But still he had a lot of initiative; witness the campaign leading up to Vicksburg. He also listened to his people, sometimes when he shouldn’t have, like at Champions Hill, although he did say that his people wouldn’t have been satisfied at the siege without the assault. Was he the best battle leader in American history? No. That would be Patton, Lee or maybe Forrest depending on who you believe. As a Lieutenant General only Marshall and Eisenhower come close. 4.) The False heroic. Keegan’s example is Hitler. This has elements of the others, but is rigid, unyielding to the point of ridiculousness and rarely indeed comes to a good end. It also tends to keep it practitioner sequestered from the troops which is also often a problem. I wouldn’t recommend this model. 1.) I don’t think we have to talk about this much, you know as well as I do (if you don’t you are on the wrong blog) what integrity is. One way to put it is: Doing the right thing even when no one is looking. Another is doing the harder right instead of the easier wrong. I don’t have much to add to that except a couple of points. In my career I have never blamed a subordinate (to a superior) for something being done wrong, if it was on my watch, it is my fault. He will find out what I think about it, though, from me. The opposite is also true. If you can give a subordinate credit to a superior, you’ll attract the best subordinates. You may not advance as fast in your organization though because you’ll keep losing your subordinates to other jobs, but you will accomplish a lot. 2.) We used to call this simply “Continue the Mission”. What else is there to say? This isn’t a graduate level course on leadership, it a short entry into the field. Much has been written; a lot of it is bushwah. If you keep this in mind though, you’ll see a difference in how your team (or organization by any other name) functions. And remember two more things. Bad news isn’t like wine, it doesn’t get better with age, and If you tell the truth, you don’t have to remember what you said. OK, it’s your turn; tell me what you’ve learned over the years.